^ Mathieson, Ian (2003). “Falkland Islands/Islas Malvinas”. Americas Review 2003-2004. Kogan Page. pp. 316–21. ISBN 9780749440640. http://books.google.com/books?id=5SpfhmFHyjwC&pg=PA317 2013年2月1日閲覧。. ^ Wagstaff, William (2001). 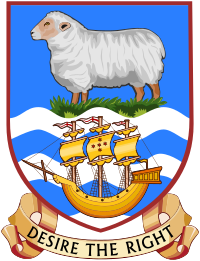 Falkland Islands. Bradt Travel Guides. p. 18. ISBN 9781841620374. http://books.google.com/books?id=LBSzvruimFgC&pg=PA18 2013年2月1日閲覧。.